England is under threat from Napoleon, but it doesn’t affect those in high society, or does it? Charles Baker, the young Baron Glazebrook has happily fallen under the spell of a man of dubious character. He is rampaging over London, enjoying everything that a young man with a fortune could wish for. Clara Baker is compelled to try and protect her brother, no matter what the cost is to herself or her reputation. She made a promise to her dying mother and nothing is going to divert her from her mission. Edmund Ainscough, Earl of Chertsey is a man with a reputation. His welcome in the seedier side of society makes him the perfect target for those in authority who want to know who is loyal to the King. Three people thrown together find their worlds, values and feelings can all be changed in an instant. All will face their deepest fears in this novel of love and betrayal. My Lord the Spy is a charming, traditional regency romance. It has a real feel good feeling which made it a perfect reading choice to cosy up with on a cold, dreary day. The story has everything that I associate with the genre; lighthearted banter, spies and smugglers, humour and romance. Best of all, it had a little bit of suspense which made it an exciting read as well. I was happy to spend all day listening to this book. I was also happy to note that this is a clean regency romance; they are in short supply. And I am delighted to have found a new author to recommend to a much loved aunt. I have listened to many of Melanie Fraser's performances. I've enjoyed them all and as a favourite narrator I knew that I wouldn't be disappointed with her performance of a regency romance. 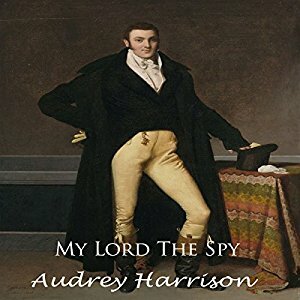 I think this is one of my favourites, probably because I love the genre and her narration of My Lord the Spy complemented it so well. Her polished accent and lovely diction really enhanced the story as her narration adds an air of authenticity to the characters and the time period they live in. This is something that narrators who perform with an American or regional accent just can't offer. There were quite a few different male and female characters to perform in this book and they were each done incredibly well. Each voice seemed to match them perfectly. Clara's voice in particular reflected her youth and sweet nature. Edmund's was suitably masculine and older than Clara's brother, Charles. I enjoyed the sprinkling of sound effects. They added to the ambience of the scenes without being a distraction. My favourite was the background sounds on the beach during the smuggling activity and the scenes in the cave. I'm itching to read Henry and Millie's story in the next book!